Adult Training — The Speed School Inc.
A 12-week specific program designed to challenge the individual's physical, mental, and emotional constitutions. Goals will be set and accountability will be managed bi-weekly that supports the individual's purpose for starting the program. Call today to set up an assessment and commit to changing your life. 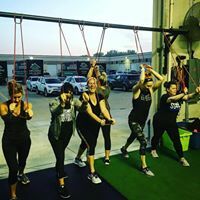 This program is ideal for those who like to work out with friends. If you know you like to be pushed by someone you know and have a competitive nature, this is the class for you. These training sessions are typically 2-4 people, set with one trainer. Common groups include friends, husband-wife, siblings, mother-daughter, and father-son duos. These sessions are more cost-effective than the traditional 1:1 training. Call today for pricing and scheduling. For those who enjoy working in a 1:1 environment. Our trainers will personalize the workout to your ability level. This product is for those who have a busy lifestyle and a schedule that varies. Call for pricing and scheduling.